At about 5:00pm everyday a cool ocean breeze makes its way through Culver City, creating a quiet rustling of the trees. This is the background noise for the small events that are already set in motion. Serenely, these trees sing natural praises, an overture if you will, of families and friends coming together for a collective purpose. And come they do for baseball games, barbeques, dining, and jazz at city hall. But in this microcosm, of this small town, there is an astonishing production company - dee-Lightful Productions – an amazing organization that molds young thespians and teaches kids the fine art of drama. dee-Lightful teaches the craft and builds promising young performers and citizens. A reasonable person would expect, that in the heart of tinsel town, there would be a need to train young performers, in voice, movement, and acting. And, for young beings, if Shakespeare isn’t the first thing that comes out of your mouth at a tender young age then this might be the thing for you, learning your craft, and building a lot more confidence in your abilities, as an actor and a person, with someone who truly cares, Dolores Aguanno the Producer and Founder of dee-Lightful Productions. Why hone the craft? Because every child is going to grow, and every actor needs a venue to build confidence, and a sense of self, so why not do it right here in breezy Culver City. dee-Lightful Productions proudly presents Grease School Version, Book, Music, and Lyrics by Jim Jacobs and Warren Casey and directed by Dana Murphy. “Grease: School” is presented by special arrangement with Samuel French, Inc. and Robert Stigwood. The kids have been working for a number of Saturdays to put this production of Grease on the boards. I was there on Thursday June 13, 2013, to witness the Systematics cast and as they came out on stage for the opening number “Alma Mater”, I thought it was going to be a small cast, but then more actors appeared on stage, and then it seemed like there were hundreds up there singing and dancing. That’s a lot of kids actors and singers to wrangle but Dana Murphy, the Director/Choreographer, and Allegra Williams, Assistant Choreographer, did a very fine job getting this terrific show up on its feet and, by the way, who doesn’t love Grease. Oddly enough, there’s something missing from the whole program. And that is that dee-Lightful Production does not have a permanent venue. The last performance I saw was a great Willy Wonka at the Veterans Auditorium (see write up here on this blog). And this time Grease was playing at Turning Point School Auditorium. Both are terrific venues but, in facto, not a permanent home. One day Dolores, one day. Still, there were a lot of things to like about this production as dee-Lightful incorporated a cornucopia of other media. My daughters loved the video montage in the beginning, and the horror video montage that cleverly fit into the drive-in theatre scene. “Freddy, My Love” with Marty and the Pink Ladies was very lovely. “Grease Lightning” complete with a tiny slow moving electric two-seater was tremendous, sung with toned down lyrics from Kenickie and the Boys. 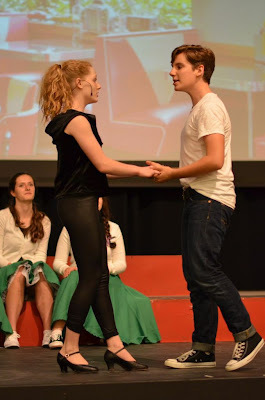 “Born to Hand Jive” was inspirational! 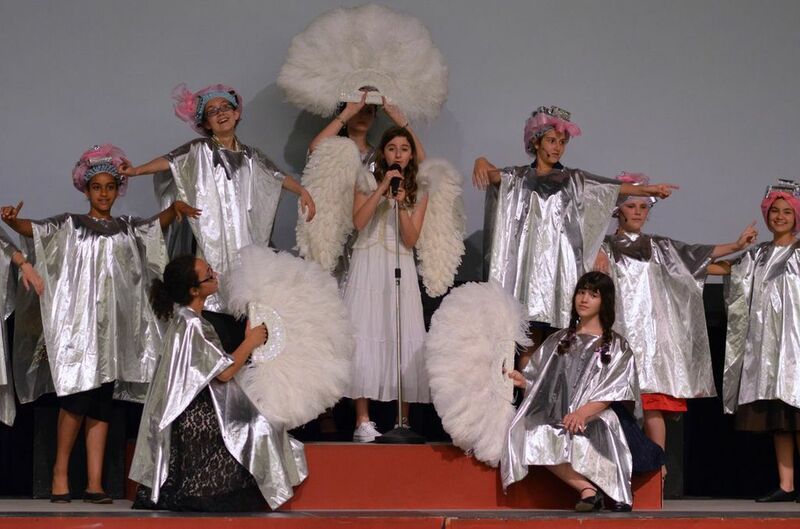 And “Beauty School Dropout” with Frenchy, Teen Angel, and Angel Backups was another highlight of the show. The kids are not quite the ages of our high school seniors but the singers and actors, a wonderfully diverse gathering, gave it all they had on this particular night. The performances were heartfelt and magical gifts to the audience. 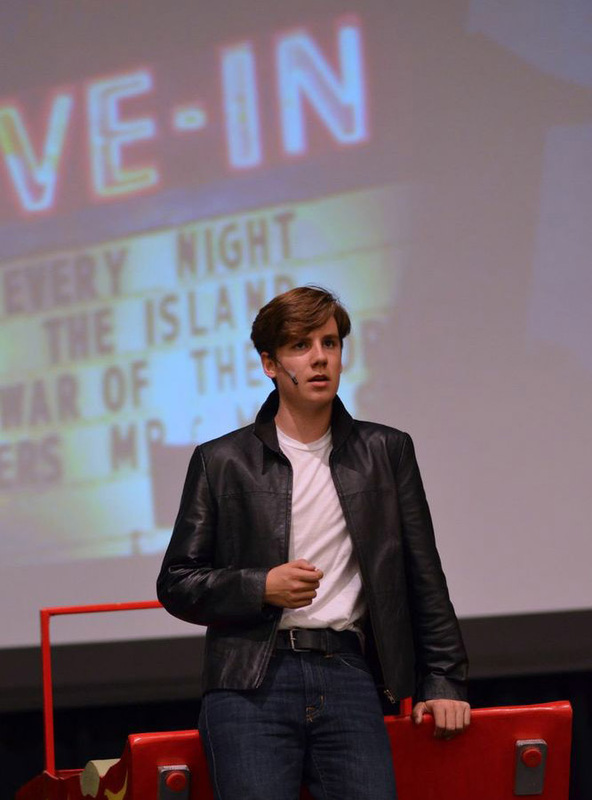 Samuel Petersen shows he can move and sing as Danny. Emma deZarn has a lot of stage presence, and is a superb Sandy. Mikaela Barocio had me totally convinced that she was young man playing Kenickie. Ben Hilsberg does some nice work as Roger. Andy Bobrow was Doody, and who can forget Doody. Merrick Padilla played Sonny and has a pleasant voice and an appealing look. Carly Shiever did a fantastic job as Rizzo. Jessie Grimaldo did a nice job as Jan.
Livi Plesent was sympathetic as Frenchy. Lily Fanali has a very nice look as Marty. Emma Snyder as Susan has a wonderful smile. Emma Kessner worked out great as Peggy and Gaby Cornejo showed a lot of potential as Johnny Casino. Samantha Spector as Teen Angel has a nice voice and the “Beauty School Dropout” scene was perfect, wonderfully done. Julia Thau who played Patty Simcox has a tremendous voice and was oh so very cute. Isabel Jacobs was funny as Miss Lynch and she is in that role for both casts. Christoph Moore played Eugene and that character is a favorite of mine. Haynes Toennies was engaging as Cha Cha. Caitlyn Crowe did some very nice work as Vince Fontaine. The cheerleaders Samantha Spector, Alexis Silvera, and Haynes Toennies, were nifty and funny. There were some problems, this opening night, mostly mic problems, the car Greased Lightning had to be pushed off the stage at one point, and there was an occasional mishap, a grand learning experience. But overall the night was wonderful, everyone had a great time, and some of the numbers were unexpectedly amazing which is what you come to expect from a dee-Lightful Production. John DeFaria who played guitar led the Rock and Roll band. Aaron Guzzo was on the keyboards. Carter Armstrong played bass guitar and Peter McHugh kept a steady beat on the drums. Everyone got the chance to participate and I particularly liked the chorus showcasing downstage with the principals upstage. Everyone had the opportunity to shine and this is what I liked about dee-Lightful. Come on out! See the next performance! And support dee-Lightful Productions in their endeavors!